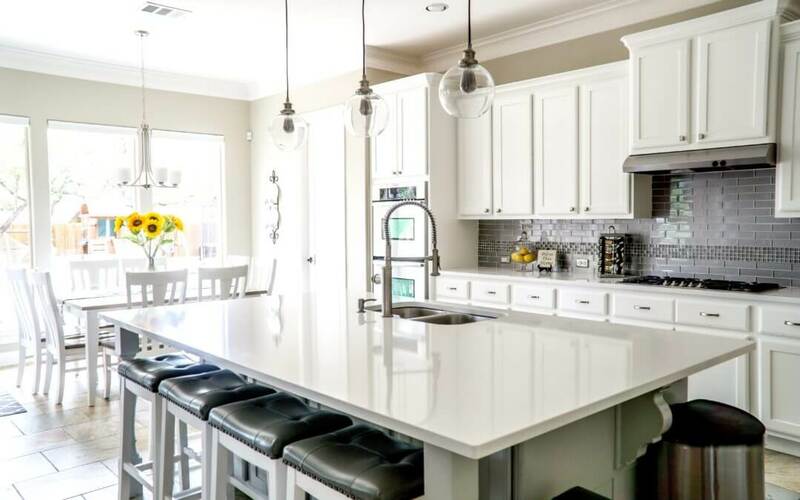 There are about a million decisions to make during a kitchen remodel, and some of the biggest ones are bound to be about your kitchen cabinets. The cabinets are the foundation of any kitchen design, so you want to get them right. Along with your appliances, they are the workhorses of your kitchen and will get heavy daily use, so they should function well. They also take up a major portion of the visual space in the room, so they should look great and blend with your overall decorating style and color palette. One of the big decisions to make about your kitchen cabinets has to do with the way the doors and drawers are framed. 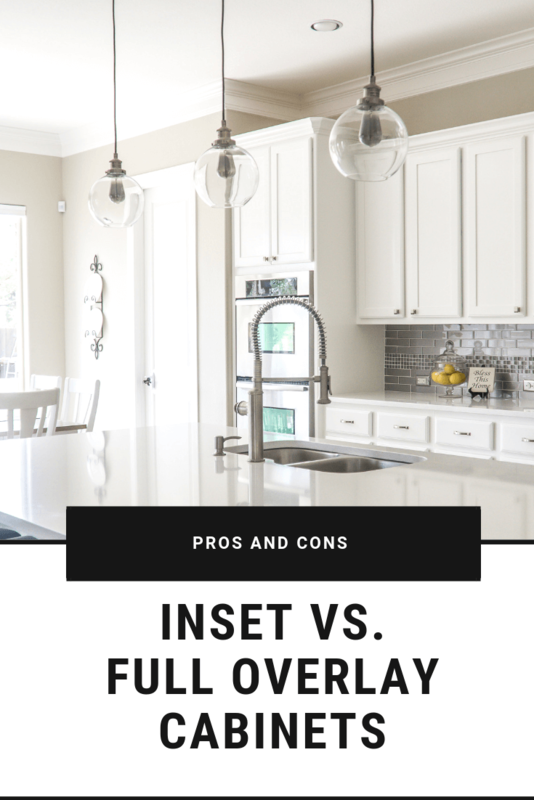 Do you want inset cabinets or full overlay cabinets? Before you decide, you’ll need to know the difference. To understand your options, it first helps to visualize the way your cabinets are built. In general, the cabinet itself is a box with an open front where the door goes. In framed cabinets, this front has additional rails and stiles that form an edge, or frame, around the opening. These strips of wood provide something for your cabinet doors to attach to and close against. When you have inset doors, the doors are designed to sit flush against the face frame. For example, when the drawer is closed, it will line up exactly with the face frame of the cabinet, rather than sitting above it. This provides a streamlined look. Inset cabinet doors may have visible or hidden hinges, depending on your preferences. Clean Look: The smooth front provides a clean look, and corners won’t be easily nicked because they’re protected within the cabinetry when closed. Historical Accuracy: In older homes, inset cabinets can help emulate the style of a particular time period. Better Craftsmanship: Because inset doors require more skill to install, these cabinets are usually well made overall. Higher Cost: The craftsmanship and time required to make inset cabinets increases the overall price — often by thousands of dollars. Humidity Woes: In humid climates, wood doors ad drawers can expand and stick, making the cabinets hard to use and perhaps rubbing away the finish on tight spots. Full overlay cabinets have doors and drawers with extra-large fronts. These are designed to fully cover the face frame. Whereas the face frame is entirely visible on an inset cabinet, it is completely hidden on a full overlay cabinet. Hinges are hidden from view as well. The overall look is also streamlined but tends to be more contemporary since this is a newer method of cabinetmaking. Streamlined Look: Full overlay cabinets also present a unified front since the overall look is smooth. This is different from the partial overlay cabinets popular a few decades ago, which showed the face frame in the spaces between doors and drawer fronts. Lower Cost: Full overlay cabinets take less skill to install and are therefore less expensive. They’re a good alternative to inset cabinets for tighter budgets. More Storage: Because the doors are mounted on the face frame instead of inside it, there’s more room to squeeze large items through the opening than in inset cabinets. Hardware Required: There’s nowhere to slide fingers in between the doors of full overlay cabinets, so you’ll definitely need to add knobs or pulls. Exposed Corners: Because the corners of the doors and drawers are exposed, they can be more easily nicked or rounded over time. Both inset and full overlay cabinets are beautiful choices for your kitchen remodel. Consider the pros and cons of each as you shop, and you’re sure to get a look that suits both your style and your budget.